I recommend that all beginners should first familiarize themselves with different parts in the construction of an arrow. In this blog, we will explain the technical specifications of different arrow parts and how to select the right arrow for your bow and shooting need. We must first begin with explanation of a phenomenon called “Archer’s Paradox”. A static arrow is straight and most beginners assume that it also flies straight when shot. When we release a fully drawn string, it applies sudden force on a static arrow and the arrow bends in centre as a result of this compression. There are a number of factors that affect how much an arrow will bend when shot from a bow. This phenomenon becomes significant and causes the flight and accuracy as you start using higher draw weights. Let us understand a few technical aspects of an arrow that you must consider before selecting the right one for your needs. It is important that your select the right length of your arrow. We use different arrow lengths for bows with different draw lengths. It is a time tested agreement that your arrow length should be minimum 1” longer than your draw length, so that when you draw the string to full length, the arrow hangs out about an inch over the arrow rest. A shorter arrow increases the risk of the arrow sliding down the rest and can cause serious damage to equipment and the archer when shot. On the other hand, a longer arrow adds unnecessary weight and increases spine, affecting the speed and performance of your shots. The other aspect of an arrow dimension is the diameter and wall thickness. We select the right diameter by calculating the suitable spine for a given material, length and diameter. Arrows are available in different materials like wood, bamboo, fibre glass, aluminium and carbon fibre. Since 90s, the carbon fibre arrows have really taken over the most preferred material for the arrows, as carbon fibre is the lightest among all these materials. Fibre glass is a very strong material, but it adds a lot of weight, thereby affects speed. Aluminium became very popular before carbon fibre appeared on scene. Aluminium arrows are less resistant to bend memory than carbon fibre. Bamboo and wooden arrows are liked for their traditional heritage value and looks, but these tend to break too often. Arrow weight is another very important parameter is selection of right arrow construction. Lighter the arrow, the faster and farther it will go, but carries smaller penetration power, whereas the heavier arrows tend to lose trajectory and do not go very far. So does it mean that lighter arrows are necessarily better? There is a limit to the lightness also. Modern compound and recurve archery bows can shoot with a great amount of energy. An underweight arrow will not provide necessary resistance to the string push and as a result, the string will transfer energy to the bow limbs and it will jerk violently. This can damage your bow and string. Firing an underweight arrow is like dry firing. The archers world over have accepted a minimum of 5 grains weight per draw pound weight. While most 3D archers use 5 grains for fastest possible speed and bow-hunters use 6-9 grains per pound. 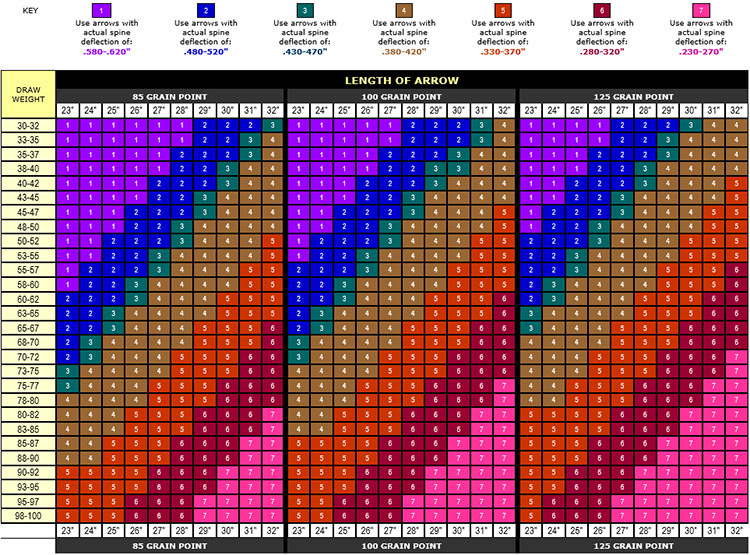 Please see the recommended arrow weight and bow draw weight chart for ready reference. An arrow needs to be properly balanced for accurate shooting. Most arrows do not have the balance at the centre of the arrow. An arrow with higher weight in the front part is more accurate. The point where the arrow is balanced is known as FOC (Front of Centre). The distance between the centre and FOC is normally 10-12% of the arrow length for higher accuracy and stable flight. Arrow points are the business part of the arrow, i.e. point is part that penetrates the target. There are a variety of arrow points available for different shooting needs. Other than the shape and function of the arrow point, you must also pay attention to the weight of the arrow point. Arrow point weight is very important factor in affecting bending of the shaft (Also known as Dynamic Spine). A heavier point will add more bending of the shaft when the arrow is released. Please see the chart below to understand the correlation among various parameters in suitable arrow construction. This is the most important parameter that you have to bear in mind while selecting your arrow. Spine is a measurement of stiffness of arrow shaft. You will need to select a suitable spine parameter for your bow. A correct spine is critical when the arrow takes flight and bends due to sudden compression (Archer’s Paradox). A too stiff or too limber arrow will adversely affect flight stability and accuracy. Generally speaking, you should select a stiffer arrow for higher poundage bow and limber shaft for lighter draw weight bows. Spine is a measurement of bending of arrow when a weight is suspended in the centre of the shaft. As per AMO (Archery Manufacturer Association) specifications, spine is measured by placing an arrow on two wedges 26” apart and by hanging a weight of 1.94 Lbs in the centre; the displacement of the centre in inches is spine. This spine measurement is static arrow spine, however in flight arrow spine is influenced by static spine, Bow cams, Bow draw weight, darw length, arrow length, weight and arrow point. All reputed arrow manufacturers have calibrated their arrows for different parameters of Bows and arrows. Please see the chart below for recommendations of arrows based on these varying parameters. Fletchings help stabilize the arrow in flight. The fletchings are parabolic shape light feather or plastic. Usually, 3 or 4 fletchings, also know as vanes, are glued symmetrically near the base of the arrows. Here are a few factors to consider when you select your fletchings. Fletchings are made different parabolic profiles varying in length from 2” to 5”. The standard Duravanes are the most popular choice for archers today. These are made from light-weight rubber. These are excellent all weather shooting choice as these are less expensive and practically, maintenance free. Plastic vanes are not as good as properly made hard turkey feather fletchings, but are good enough for the task. Occasionally, one or the other manufacturer introduces different shape and material of vanes, claiming certain performance advantages. I personally, do not find much enhancement worth the trouble. There have been many speciality vanes like Blazer vanes, Quickspin, Vanetec etc. Now, the next question is what size of the fletching makes more sense than the other. This question is very simple to understand. The larger the vane, more surface area it has. A larger surface area creates more drag on the arrow, hence slows down the arrow, but adds more stability. Normally, 3D target shooters prefer shorter flethings and bow-hunters choose a longer one. Feathers are the original fletching material for arrows. Feather are certainly more effective in arrow flight and stabilization. A 4” turkey feather fletching weighs (6-8 Grains) 3-4 times lighter than a comparable plastic vane (24 Grains). Feather fletchings are very expensive compared to plastic vanes and are a maintenance nightmare. For all practical shooting needs, plastic vanes are good enough. Another important consideration is how you arrange the fletching on the arrow. A helical fletching configuration definitely helps stabilize the arrow as this pattern makes the arrow spin in flight. A helical arrangement is surely the best for arrow flight, but it is not always possible to use helical fletching as your arrow rest may not have enough clearance to allow helical fletchings to pass uninterrupted. Archers sometimes, also use right of left offset pattern to add spin in arrow flight. Normally, competition archers use straight fletchings. Please see then graphics below for better understanding. We will continue to update and improve this blog. We appreciate sharing your comments and experience to make this blog really informative for beginners and professionals as well.